Net gain on financial assets classified as at fair value through profit and loss amounted to US$2.07 million compared to a loss of US$437,923 last year. For the three months, net gain on financial assets classified as fair value through profit amounted to US$1,38 million compared to a 2017 loss of US$1.18 million. Interest from loans and receivables amounted to US$175,283 a decrease of 30% year over, while the company reported dividend income of US$435,612 compared to US$350,399 reported last year. Other income for the year amounted to US$86 compared to US$411 booked last year. As a result, revenues totaled US$2,685,230 for the year ended February 2018, compared to a 2017 figure of US$ 163,589. Operating expenses amounted to US$787,309 for the year, a 47% decrease year over year (2017: US$1,49 million). operating expenses for the fourth quarter amounted to US$207,612, up from US$197,869 reported in 2017. Interest expense was nil for the year compare to US$ 260,068 reported for the prior financial year. Consequently, PJX’s profit for the year totaled US$1.90 million compared to a loss of US$ 1.59 million booked last year. Profit for the fourth quarter months was reported at US$1.62 million in contrast to a loss of US$1.34 million in 2017. Earnings per share (EPS) amounted to US$0.00612 (J$0.78) for the year compared to a loss per share of US$0.0051 (J$0.66). 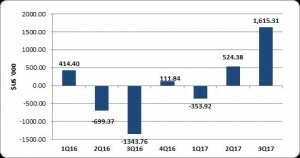 EPS for the fourth quarter amounted to US$0.00521 (JMD$0.67) relative to a loss per share of US$0.0043 (JMD$0.55). The number of shares used in this calculation was 309,968,261. PJX’s stock price closed the trading period on April 26, 2018 JMD $8.15. As at February 28, 2017, PJX recorded total assets of US$25.74 million compared to US$23.83 million reported in 2017. The major changes in assets included the decline in ‘Cash and short-term deposits’ to US$1.64 million from US$6.85 million in 2017. Financial Investments rose to US$22.07 million in 2018 compared to US$11.57 million in 2017. Securities purchased under resale agreement fell to US$1.94 million versus US$5.30 million a year earlier. Total Stockholders’ equity as at February 28, 2018 closed at US$25.66 million a 7.98% increase compared to the US$23.77 million reported in 2017. This resulted in a book value of US$0.0828 (J$10.61) per share.